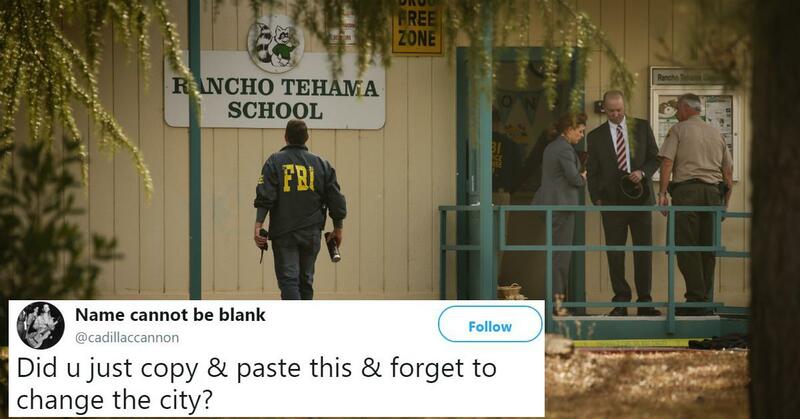 The mass shooting epidemic continues in America, with the latest tragedy occurring at Rancho Tehama Elementary School in California. Five adults were confirmed dead, and two children were shot but are expected to make full recoveries from their injuries. President Donald Trump released a statement offering his condolences to the victims of the shooting at Rancho Tehama. Except there was one problem: He got the city wrong. 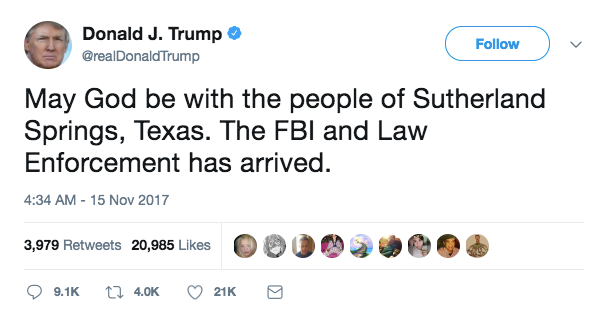 The tweet was sent shortly after news broke out of the attack, but people noticed the message was eerily similar to this one. As in possibly a copy pasta. Many people on social media have accused him of repurposing the message or having a template tweet for mass shootings. Given the number we've had this year, it's probably a big time saver. So far, there's been no clarification from official sources on what actually caused this error. In the mean time, the hot takes keep coming on Twitter, with people calling out the president for being so unfeeling he can't even write an original tweet for each mass shooting that happens on his watch. Others pointed out that if our own president seemingly can't keep track of the different mass shootings, this how big of a gun control issue America has. Others noticed his grammar was lacking, too. It was pointed out that there was a clear difference in how Trump addresses shootings conducted by white people as opposed to anyone else. Others turned the "late tweet" into an inside joke. Although Trump doesn't seem to think the increasing number of mass shootings is any reason to implement more restrictive gun purchasing laws in the US, there are plenty of other politicians who think that doing so is long overdue.